We at Keystone Window of Pennsylvania care about your family’s safety and health. Any time lead paint is disturbed, such as during remodeling or replacement window installations, lead paint particulates can present a possible health risk. Therefore, we carefully follow the lead safety practices stipulated in a new federal law aimed at mitigating lead paint health risks. Please contact us with any concerns or questions you have regarding lead safety in installation. Lead paint was deemed a serious health risk and banned in 1978. This was not very long ago, however, and there are still many homes in all the areas we serve, from King of Prussia to Doylestown, West Chester, Malvern, and many other towns, that still have lead paint. We take your concerns for your family’s health very seriously. When it comes to lead safety in window replacement and entry door installation, no one takes a more rigorous approach than Keystone Window. Your family’s health and our employees’ health are number one concern. We are committed to ensuring that all our installation crews are EPA certified to safely work with and remove lead based paint. Contact us today for more information. 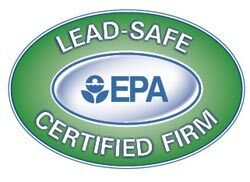 These new lead safe practices do add to the materials price and installation time. However, Keystone Windows does not profit from the added cost and time. Our primary concern is to ensure the health and safety of you and your family by properly eliminating any potential environmental hazards and preventing any exposure to lead paint. All homeowners should be especially careful choosing a replacement window contractor. Any contractor working on a home built before 1978 without proper EPA certification is breaking the law and putting you and your family in danger. Furthermore, the contractor can incur significant fines for violating this new federal law. To ensure your replacement windows are installed with the highest attention to lead safety, contact Keystone Window today!